We talk about heroes in society. Here we would like to bring you a story of an individual who survived all odds and created a school in a very remote location. Dattatreya Ganesh Nerlekar used to work with NMV as teacher for 13 years and with SP college/wadia college for 18 years under various capacities. He was denied opportunity to become principal of NMV as he was not the life member and constitution of NVM disallowed that. He had ambition to be a Principal. After his retirement, he started following up his dreams. Having studied the educational scenario in Pune in 1982, he realized real need to start up a school is not in city but in rural area. He formed an education trust appropriately named as Bhagirath educational trust to help him start the school with an aim to provide education to needy. He chosed a location ramnagar , khadakwadi which is 5 kms ahead of NDA. Since this area is protected and restricted zone due to defense establishment, only source of income for residents is agriculture. Due to irregularity of rain there is water scarcity for almost 7 months of year. In 1982 there was no school in a radius of 10 kms. With help of local villagers, panchayat members they identified a spot slightly away from village over a hillock overlooking dam back waters. There was a small hut which resident Lt Baburao Paigude donated for this cause. This hut had verandah, kitchen and two cow sheds. They used verandah as office, kitchen as teacher's room and two cow sheds as classroom. They started secondary school on10th June 1985. 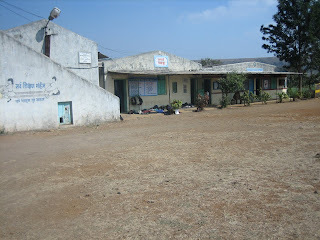 This school is named after late mrs Vimlabai Nerlekar wife of Prof D V Nerlekar. 92 students took admission there. Then there was no stopping from there. Many people and organizations helped the school. It is important to mention here names like tarla dalal. NMV 56 batch, mercedez benz, lions, Pune Riverside Round Table. Now there are around 500 children taking education here. Children have secured 87% marks in ten and overall passing percentage has reached 85. Looking at background and nature of children it is definitely an achieve-ment. These children have to travel 10kms on foot to reach school even in rainy days. There is tendency amongst parents to use children as farm labor etc. But in spite of this school has achieved this result. Unfortunately, Prof D V Nerlekar is not amongst us today to witness any further growth that happens. But his dream has taken shape and has resulted into an exemplary institution. It is all about your dreams and how you follow it.